Scotch Pies is a favourite food amongst Scots folk and many an ex-pat. It is now widely available not only throughout butchers and grocery stores in Scotland but it is also possible to buy Scotch pies in English supermarkets. It can be eaten cold, quickly heated in the microwave or reheated in the oven. It can be eaten on its own, with a dash of brown sauce or gravy or with a meal like mashed potatoes or chips and beans, mushy peas or vegetables. It has a strong spicy taste and is covered with thin crusty pastry. Most football catering vans in Scotland and chip shops will serve them as a snack to their customers. The meat in it varies from the traditional Scottish Scotch pie made from mutton (lamb) whilst other bakers and butchers will add minced beef. A common question we are asked is how many calories are in a Scotch pie. Too many judging by my belly is my answer! 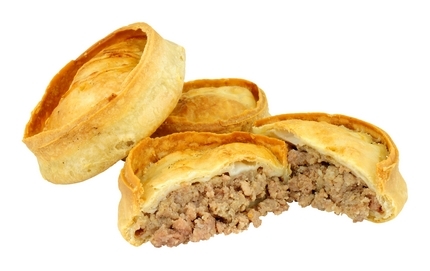 The other names for Scotch meat pies are mince pie, mutton, pie, savoury pie, football pie or shell pie. A typical Scotch pie recipe will have meat, salt, pepper, nutmeg, Worcestershire sauce, onion and pastry. Many local Scottish bakers will keep their Scotch pie recipes secret, especially the spice ingredients and quantities. However there is an excellent one in the Maw Broon's Cookbook. She uses minced beef or lamb and describes a step by step method for making the casing using the hot water pastry technique using lard. Buy Maw Broon's Cookbook at a discounted price and with free delivery available. Another can be found in The Complete Book of Mince . They are traditionally eaten with Buster Peas in some parts of Scotland such as Dundee. In the book A Cook's Tour of Scotland Sue Lawrence gives an easy recipe for Buster Peas and Scotch Pie. These are not unlike mushy peas and are dried marrowfat peas soaked overnight, boiled and seasoned. Some chefs like to use dried split peas for a different flavour and because it is quicker to make the Buster Peas recipe. A healthier Scotch pie was created in February 2010 by baker and butcher TR Skinner of Kippen Scotland especially for Scottish football fans. 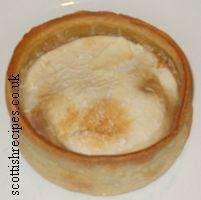 This healthy mutton pie was first put on sale at Hampden Park, Scotland by Daily Record newspaper food critic and football journalist and TV presenter Tam Cowan. This healthy Scotch pie is about 20% lower in fat.